heat oil. saute the onions first till transparent. add the green chilies and saute for a minute. add the bhindi (okra) along with the kokum & salt. stir well. place a lid with a rim on top of the pan. pour water on the lid. on a low flame, steam the bhindi till they are cooked. in between keep on checking and stirring the bhindi. when the bhindi is cooked, add grated coconut. garnish bhindi bhaji with coriander leaves. 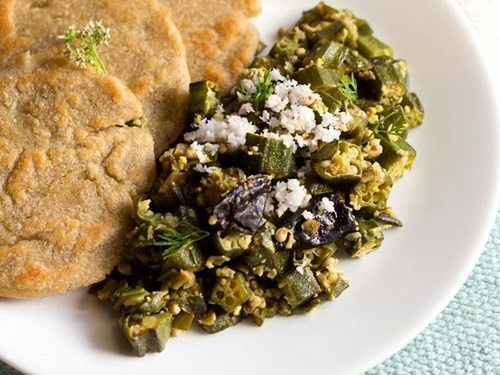 serve bhindi bhaji with chapatis or with dal-rice or sambar-rice. if you don't have kokum, then you can either add ½ teaspoon dry mango powder (amchur powder) OR ½ teaspoon lemon juice.